…it may be beneficial to investigate the long-term outcome of hip resurfacings using metal-on-polyethylene in the 1980’s. We report the long-term survivorship and modes of failure of a cementless metal-on-polyethylene resurfacing. Ongoing developments using the lessons learned from these previous generation components and utilizing modern low wear materials, e.g., cross-linked polyethylene, may lead to improved implants for future hip resurfacings. The Polymotion Hip Resurfacing device is an allergy-free device that uses a 3mm-thick cup made with a material known as cross-linked polyethylene, one of the toughest plastics in existence. 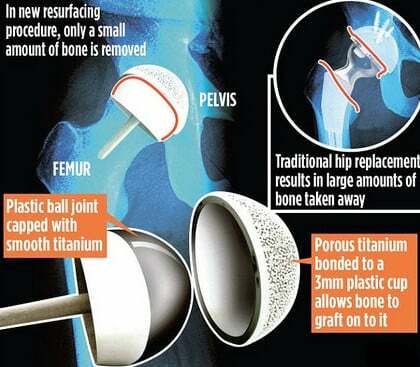 Traditional metal-on-metal hip resurfacing uses cobalt chromium alloy, explains Mr Derek McMinn, a consultant orthopaedic surgeon at BMI Edgbaston Hospital in Birmingham, who developed the new procedure. Gross TP, Liu F. – Midlands Orthopaedics, P.A., Columbia, SC.Abstract The purpose of this study was to report our clinical outcome of a large series of metal-on-metal hip resurfacing arthroplasty (HRA) using the hybrid Biomet ReCap-Magnum system. This is a single-designer surgeon series with an average of 5 ± 1 years. Seven hundred forty consecutive hybrid HRAs were performed in 653 patients. Rodgers b; David Rawlings c; Andrew W.